Despite being a regular traveller on the number nineteen tram, to memory I’ve only ever made it beyond Brunswick once before. The second time, as it goes, would happen just this past Friday evening. This would also be the evening on which the holy Food Truck Gods (closely related to the Brunch Gods) would look down upon me, and deem to send a torched-up treat my way. It was divine intervention. There’s really no other explanation. The Brûlée Cart was in Coburg. I was in Coburg. 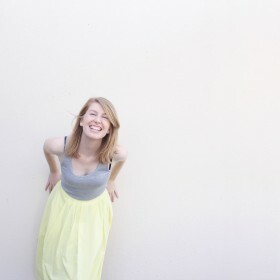 The stars had aligned and as soon as I’d signed off for the delivery of my three-piece timber bench and table set, I was rattling back down the number nineteen line on another mission. 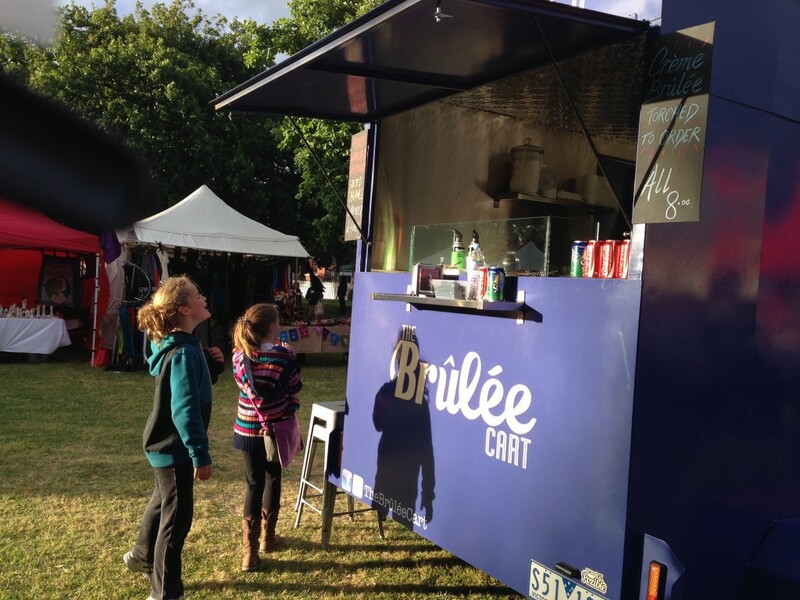 Initially funded through a Pozible campaign earlier this year, The Brûlée Cart is helmed by brothers Bart and Jack White. 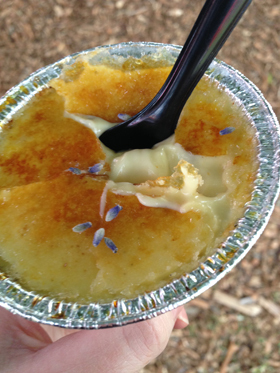 The food truck industry is certainly thriving in Melbourne at the moment, and there is some seriously delicious, gourmet food on offer – but I have to say that a crème brûlée truck is one after my own heart. I’d previously tracked the Cart down once at Trailer Park (Salted Caramel), and another time in the streets of Brunswick (Dark Chocolate and Peppermint). It seemed Friday night would see me a third time lucky. It was a short journey before jumping off the tram and heading to Bridges Reserve, nearest to the corner of Sydney Road and Bell Street. The Coburg Night Market was alive and busy with people, but not so big that it didn’t feel like an genuine, local market. 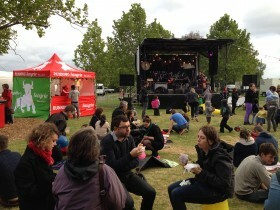 I noticed especially that there were a lot of kids and families about, and market-goers spread out across table, chair and lawn to eat and drink and listen to live music. 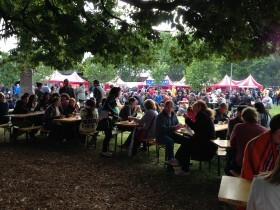 There were plenty of tasty-looking places to eat, including stalls from Phat Brats, Wingman Chicken Wings, Meatball Company, Mr. Calamaro, Running Sangria, Trailer Made and Bianco Latte Gelato. It was a wonderful atmosphere and I’d definitely recommend swinging by one warm Friday night before it finishes up on the 20th December. It was, however, a familiar wash of blue that beckoned me across the market – and before I knew it I was cracking the top of my very own Lavender & Honey crème brûlée. Also on offer that night was French Vanilla & Raspberry and Salted Caramel. I’ll maintain that Salted Caramel is my all-out favourite, but the Lavender & Honey was delicate and delightful in flavour. The brûlées are $8 each, and the perfect size to sate a sweet craving (although I think I could definitely eat at least three of the Salted Caramel one after another!). It’s true – I am over the moon with my new outdoor dining setting (on this balmy December 1st evening, I am indeed sitting comfortably on the outdoor terrace sipping on what turned out to be a glass of room-temperature water.). But I had another calling that night, and I am proud to claim that I rose to meet the almighty challenge. Most importantly – I must bestow upon you the urgency to claim such victory for yourself! Whether on a definitive mission or simply on your travels, The Brûlée Cart is so, so worth your visit. Seeing how this Europe trip have been an accidental food tour, you’re being cruel & teasing me to return to Melb for more amazing food. I love The Brulee Cart! The Lavender & Honey looks lovely…wish I had tried it! But Salted Caramel is definately my fav too! It’s wonderful, isn’t it? :D Dessert trucks are my favourite. 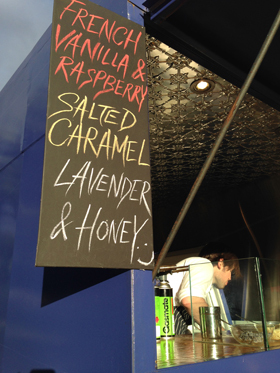 I’d certainly recommend giving the Lavender & Honey a go – but I have regular cravings for that Salted Caramel! I saw once that they did a Dark Chocolate Ginger – definitely keeping my eye out for that one again! The flavours work wonderfully together – the only other time I've encountered it was at Cupcake Central who have had a lavender and honey cupcake on their seasonal rotation a couple of times and it's just divine!